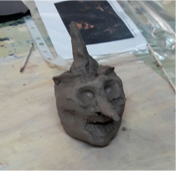 On the 24th of October 2016, we held a holiday workshop, titled creating Clay heads, inspired by Anthony Gormley and Macbeth. The concept of drawing a face might seem very simple to us. After years of drawing dots for eyes like the work of Gormley, the transition into looking closely at a face and creating a portrait that is recognisable is quite the challenge. The task of an accurate portrait of someone is one that a lot of seasoned artists still shy away from. Here at Kite we aim to stomp out artists fears early on and teach every child that there are no mistakes in art. We asked the children to take a piece of card and draw the person in front of them. The children are faced with two fears here, the first, creating an accurate drawing of a face. The second, interacting with another child they don’t know. With some words of encouragement they all got stuck in! 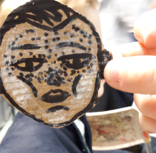 Next we asked them to cut out the face and hold it over the face of the person they were trying to draw, to see if it looks like them. This was something that Liz (my fellow teacher) and I did not think about. The children all put the piece of card up close to the other child’s face. The concept of perspective is an obvious one to us, if we want to view something covering something else we hold it closer to us. The further away it is the smaller it will be. This isn’t instinctive to an eight year old. Then the fun started. How to teach perspective to under tens? With our thinking hats on, we grab a camera and a card face, hold the card close to the camera and get our subject to stand further back, snap, photo is taken. The children are shown and everyone gets it. Now they all want there photos taken too! 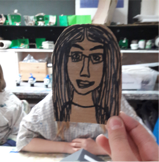 The camera gets passed round and soon we have a whole art class of children with cardboard faces, printed out and stuck in their sketch books. That was only the first activity! It’s not just the children that are always learning at Kite, we as teachers are constantly adapting to the class and evolving ourselves. The next activity everyone loves i.e. squishing clay. 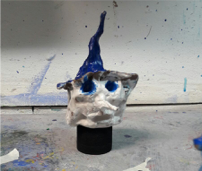 We show them Anthony Gormley’s clay faces as well as some images of the witches from Macbeth. A quick chat about the story of the witches and everyone is desperate to start making. We show them how to pinch out a nose and poke in eyes, pull out a hat and push down the rim. Even with the same instructions, each witch is different some are pointy, some friendly, some funny, some scary each one fantastic. 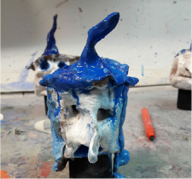 The children paint them all, then do a drawing of the final project. We all reflect on the day by taking imaginary photos of the challenging activities we did, the activity we did we’ve never done before and the activity that was most fun. For some children the toughest activity is also the most fun, some like drawing more and some like clay. We see one thing over and over again in our holiday workshops, the under sevens love everything they make, but the moment we teach the eights and up class, the self doubt monster begins to show up. At Kite the self doubt monster is left at the door and the children in our classes learn to be proud of every art piece, mistakes and all.